Graduate students work for Japan Shiatsu Clinic, spa in hotels, massage clinics, open own Shiatsu clinics, being a Shiatsu instructor and so on after graduation. Here is a success story. One of our international graduates went back to his home country and opened a clinic there. After that, He tried to get Shiatsu covered by governmental insurance and now Shiatsu is covered in his country! 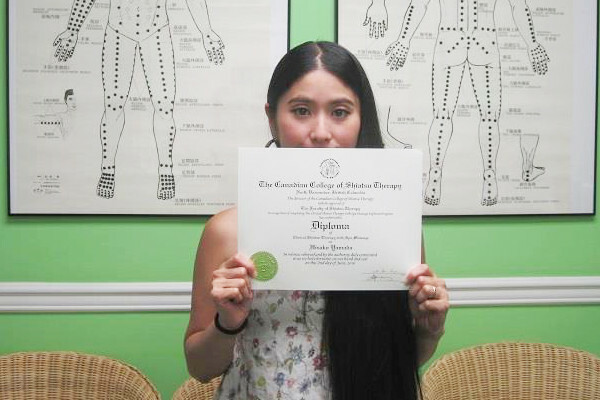 Also, another student got licensed massage practitioner status in WA USA and opened her own clinic in USA. Many of the graduates are active all over the world based on experience and knowledge learned in CCST. This data is as January 1st, 2017. 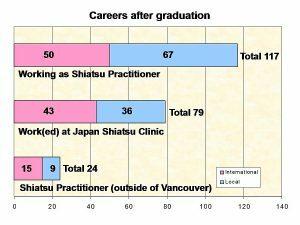 Q : What made you decide to study Shiatsu at the Canadian College of Shiatsu Therapy in Canada? 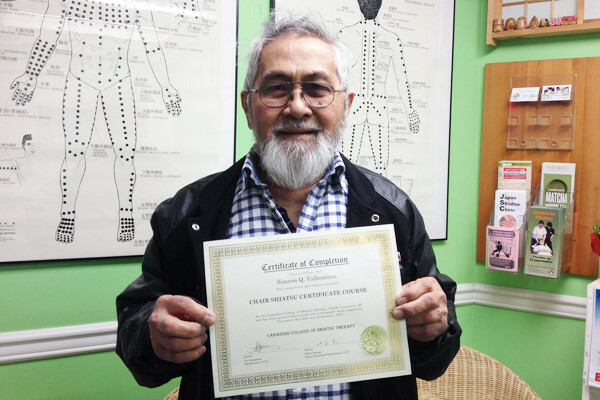 So far, I have experience in healing mind and spirit, and I saw Shiatsu as an opportunity to integrate the body in the healing modalities that I can offer. I am very interested in the Eastern philosophies and traditions so that I see many benefits that Shiatsu can offer to the Western world, especially in the area of alternative/preventative health and stress relief. 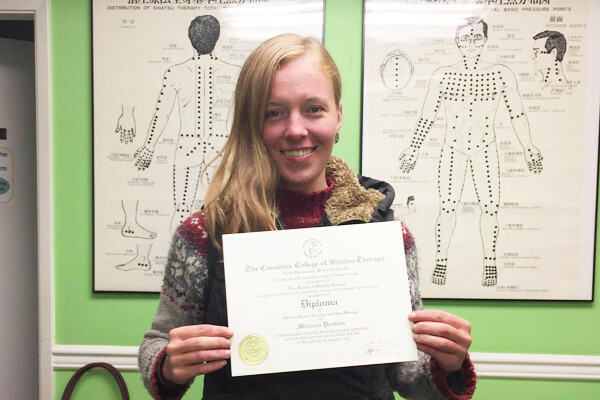 I chose the CCST because its curriculum combines theory, clinical placement and fieldwork and it gives me the possibility to apply for Shiatsu Therapist status at the Canadian Shiatsu Society of BC after I have completed the program. Q : How is your clinical placement going so far? I enjoy the clinical placement very much. It’s very helpful to work with clients to improve my skills and gain more confidence and trust in my abilities. I also love to interact with the clients and to create a positive and trusting relationship. I feel very rewarded if a client tells me that Shiatsu is beneficial for him or her. The assessments are beneficial to receive professional feedback and to support me in improving my skills. I feel well supported by the instructors and I appreciate to be able to ask any question I might have during the clinical placement. Q : What is your future plan after graduation? 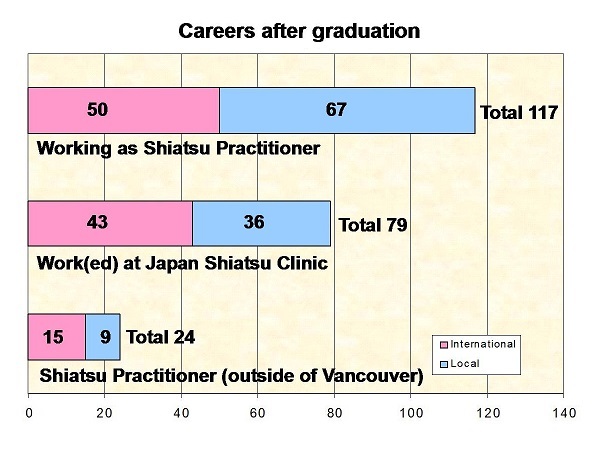 My dream is to be able to stay in Vancouver and work as a Shiatsu therapist. On a longer perspective, I want to learn more about using Shiatsu to heal emotional trauma and to understand the body/mind/spirit connection in a deeper way. 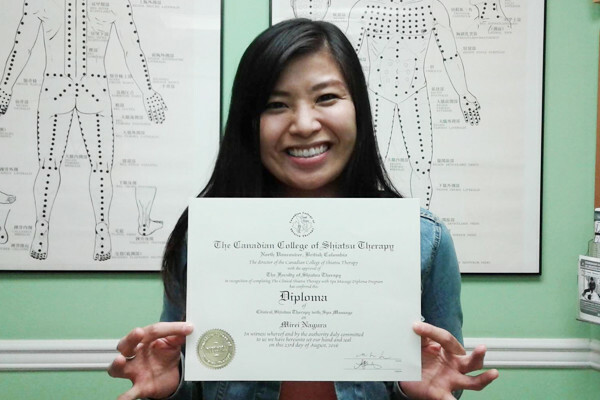 Here is a feedback from Maya Kaneko who graduates the diploma program at the Canadian College of Shiatsu Therapy. Q : What did you like best about the curriculum? Aside from Shiatsu, I also have enjoyed the spa therapies portion. It was interesting to compare other manipulative therapies with Shiatsu. We learned Thai massage, Reflexology, Aromatherapy, and Swedish massage. They are very wonderful massages because some of these therapies can apply to deep tissues or reflexology and so on. ‘Is it similar to Shiatsu…?’ That was my first impression honestly. I was learning that Shiatsu is the superior form of therapy, but now I see how other spa therapies can be useful as well. Therefore I would say I really like Shiatsu. My plan is to focus on Shiatsu first then work on using the spa therapy techniques later on. Q : What was the most memorable thing in your student life? Absolutely, I would say the ‘Student clinic’. At first I was thinking that I needed to complete 200 clients. I was focused on the numbers. But as I got deeper into my schedule, I came to realize that each client is unique. Each client is more than a number. I had to get to know them and learn what works for them and what they like. Trying to be more adaptable. I enjoyed that process of discovering that I can’t approach the clinic portion just by focusing on the number 200. As I went along, I found it rewarding by learning what made my clients happy. In the end, I look back proud of my client services, and hope I helped all of my clients feel better. Q : Tell us about working at Japan Shiatsu Clinic which is affiliated with Canadian College of Shiatsu Therapy. I am very thankful for the chance to study basic Shiatsu and advanced Shiatsu. From my studies, I have learned many different ways to help my clients depending on what they tell me when they arrive at the clinic. I really enjoy listening to my clients and figuring out exactly what is bothering them. I always ensure I ask the client what they need (what’s bothering them), if they have any conditions, how much pressure is comfortable for them etc.. And then applying one or more of the many techniques I have learned to help them feel better. 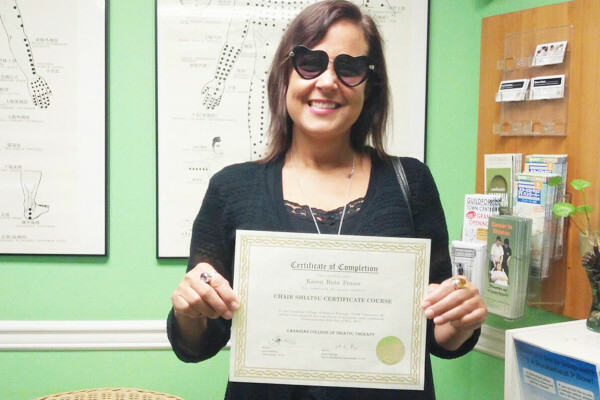 I am confident that my skills are beneficial to my clients and look forward to helping many people feel better. Everything that I learned comes from the class and the student clinic. But most importantly, I have learned that I care about my clients and want them to feel better. I think this is the right approach so customers can feel relaxed and consider having Shiatsu Therapy. I am very happy to be working at a Japan Shiatsu Clinic, and also I am thankful to have a chance to learn Shiatsu at the Canadian College of Shiatsu Therapy. It is also a good opportunity to improve my English language skills and in turn, as I improve, I hope others will be able to learn from me as well. 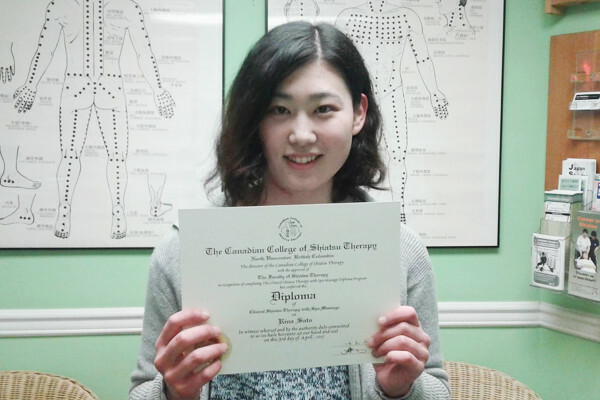 Here is a feedback from Manami Yamauch who graduates the diploma program at the Canadian College of Shiatsu Therapy. 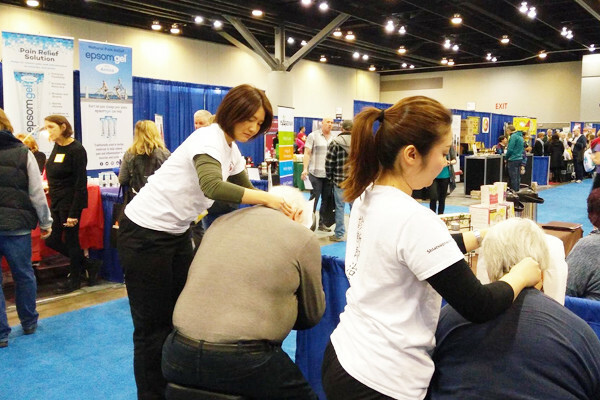 Q : Tell us about working at Japan Shiatsu Inc., whose clinics are affiliated with the Canadian College of Shiatsu Therapy? 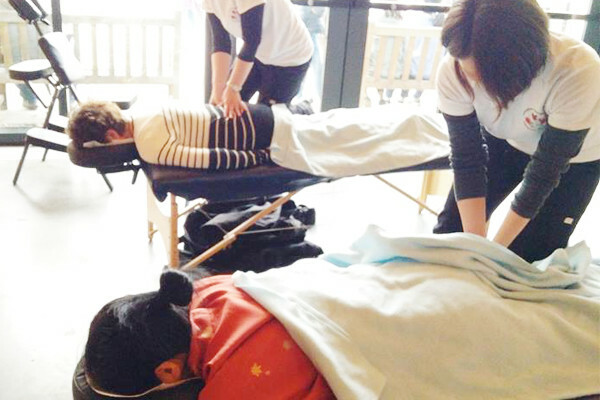 The Canadian College of Shiatsu Therapy allows students to work at the Japan Shiatsu Clinic, and even win a scholarship. Working there was a great opportunity for me to improve my skill, having to formulate a treatment plan for each client and learning lots of things that go beyond what can be done in the school clinic. I had a client who was suffering from serious arthritis; after treating him three times, he was able to walk without his stick. Another client, who was suffering from frozen shoulder, was able to raise his arm after the treatment. Experiences such as these made me confident as a Shiatsupractor. After graduating from the Canadian College of Shiatsu Therapy, I worked at the Westin Hotel in Whistler as a spa therapist and Shiatsupractor, doing Shiatsu, reflexology, hot stone massage, aromatherapy massage, and sports massage. That’s when I realized how valuable the school clinic had been in terms of gaining skills and experience. Now I work at the absolute spa at Park Royal as a spa therapist and Shiatsupractor, and also at the West Vancouver Acupuncture Clinic as a Shiatsupractor. I’m even more grateful now for my Shiatsu training, as I’m the only person who offers Shiatsu at the absolute spa. 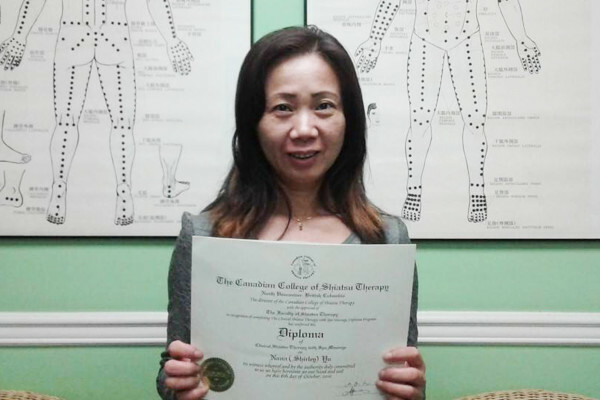 Here is a feedback from Cassandra Amaral who graduates the diploma program at the Canadian College of Shiatsu Therapy. There are a few things that I really like about the curriculum. I love that there is such a mix of courses. My favorite course has to be the Japanese language and culture course. I really got an appreciation for how and why the technique is done the way it is and I really got a sense of the honour and respect between student and teacher, between me and my classmates and in the client practitioner relationship. However, I also like that a course on Traditional Chinese medicine is part of the curriculum. I really believe in “whole body” healing and I appreciate that we were exposed to different healing techniques through the school. I also love that I am able to complete the course in my own time. Sciences were not my forté in high school and therefore I was able to take my time completing the courses, giving me more time to give the attention needed to each course. On that note, I really like that the class sizes are small. This really allowed me to get the help and attention I needed when I needed it. Q : What else can you tell us about the course set up? I really liked the fieldwork component of the diploma program. It got me over my marketing fears I had and was really fun to interact on a different level with people passing by our booth or station. I really like that the other part or the clinical placement is supervised by professional Shiatsupractors at the school. I love getting feedback from the different supervisors, everyone has a slightly different touch and getting little adjustments, I think, makes the treatments that I give more enjoyable as I am able to combine what I have learned. I also really appreciate that the supervisors give advice on how to maintain health as a practitioner. Their advice is very valuable. Q : Why did you decide to teach Shiatsu? I practice other alternative modalities such as CranioSacral Therapy, Lymph Drainage Therapy and Reiki and I am constantly combining those modalities with Shiatsu to create a unique and specific treatment for my clients. I have thought about teaching one of the modalities I practice and was thrilled to be asked to teach Shiatsu at the same school where I graduated. I know I have a different perspective around healing that I can bring to the curriculum and love sharing that with other practitioners (and soon to be practitioners). Q : What do you love most about teaching? I love watching the students’ process throughout their term. Everyone is always very apprehensive and unsure in the first few weeks of Shiatsu Foundation and as we go through the course, I love seeing the confidence grow within them. I also love watching the familial bond that develops from going through an academic course with a group of people. I feel very special and very honoured that I get to be a part of that journey with the students as they support and encourage each other thru the courses.